So some big news sort of this week about mothers day call home. In the past in our mission the calls home have been extremely hectic for the senior couples and for the Mission President so he has told us that some changes will take place. 1.We are only allowed one call home for a single hour. So maybe doing a massive group session on skype would not be the best idea because they take alot of time to set up. 2.The call MUST be set up in advance. Seeing as its sunday we will have to get a time when we can speak on to another that works for you and also myself. I am allowed to make a BRIEF phone call home to confirm plans, But Emphasis on the BRIEF phone call. 3. They also highly recommend you call me on the phone that i share with my companion, seeing as how this relieves the church a huge burden, but kind of directs it towards our family. So again i might call home to make a brief Phone call Soon. Our phone number right now is 0732346016 4. I can call home using Skype but i have to get a time scheduled with the seniour couples when i can call you. Plus i need to know who i am calling at what skype address. Hence the massive family group chat might not be the best. But just know as well ill be home for christmas. So expect a call from me later this week confirming plans and some small details. But this week was great. we had interviews with our mission president as well. One thing he said that made me laugh was “you have been in this area for a very long time” i kind of told him i felt like i had been forgotten about, but that i was still working hard. He laughed and said that he knew i was. 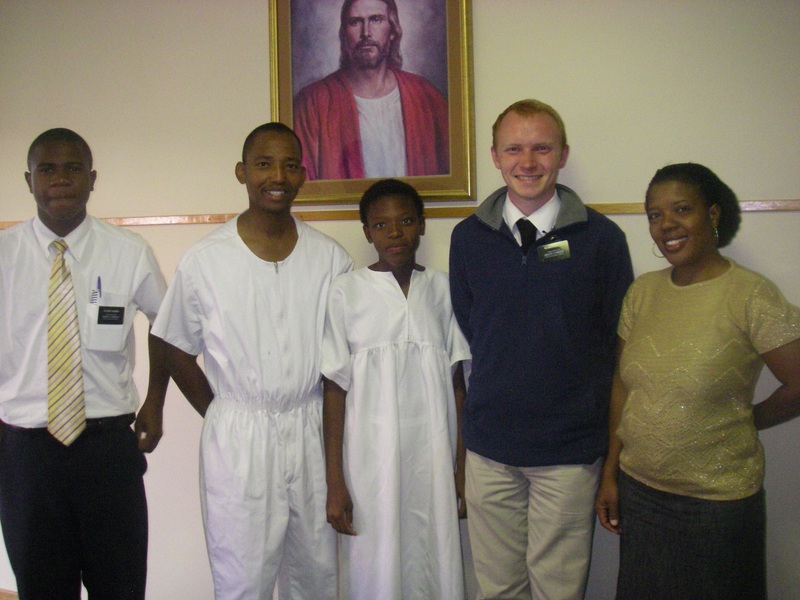 I asked him i was remaining here and he said “the reasoning why i left you there and took your companion was because i really badly wanted you to train a new missionary and this was the only way possible.” So i felt a little bit happy hearing that. I told him as well that now i actually wouldnt mind staying in Thaba Nchu for another transfer, but he said “Elder Payne… I dont think i will leave you here this transfer or even bring you back to this area. I need you help, talents and expertise in other areas of the mission right now.” So in the end it was a great interview. saturday and the converts name is Realeboha Jan. She was a referral given to us by the young women presidency four months ago and now we have been able to baptize her. Her mother is a recent convert herself of just barely a year and helped alot in the teaching process. The person who baptized her was our own bishop Sebusi who as well was very involved in the teaching process. But those are the two major things that happened this week and im happy as well to know that you al are doing so good. Continue to be honest true and faithful! Ill call you later in the week to let you know when i can call home! !